Because fire is the most important disturbance in the boreal forest, it was crucial to try to describe its history and its relation with climate and plant dynamic. Within the surroundings of the Lake Duparquet Forest (FERLD), charcoal and pollen contents of well-stratified sediments from a small kettle, Lake Francis, were analysed to detail this history over 7,000 years before present (BP). In addition, analysis of a lacustrine charcoal data-base provided a means of establishing the main features of the regional fire history and geography. This double approach allows us to study first the climate-fire relationships and then fire-vegetation relationship. The reconstruction of the fire history and geography was processed using a temporal low-resolution spatial analysis of lacustrine charcoal accumulation rate. This details fire occurrence for the last 10,000 years in Quebec (Fig. 1). The temporal synthesis of the charcoal anomalies enhances the highlight of Quebecs fire history. A period characterised by positive anomalies (+) corresponds to an environment conducive to fire, and vice versa for negative anomalies (-). This synthesis does not take into account the regional singularity due to vegetation, topography or micro-climate. Between 10,000-8,000 BP and since 2,000 BP, Quebec experienced a climate conducive to fire. Temperature did not appear to play a role because the hypsithermal (8,000-5,000 BP) period was not only characterised by + anomalies. The fire history and the lake-status history both depend on the precipitation regime. But the historical discrepancies between fire and lake-status suggest that winter snow accumulations trigger the lake-level fluctuations while late-spring or summer droughts are the principal climatic force acting on fire occurrence. Thus high fire occurrences are not inconsistent with high apparent precipitation records since over the last 2000 years when Quebec has experienced an increase in occurrence of drought events despite high annual precipitation. Fig. 1 : Temporal synthesis of the anomalies of charcoal accumulation rate during the last 10,000 years within Quebec. Fire frequency reconstruction at Lake Francis (Fig. 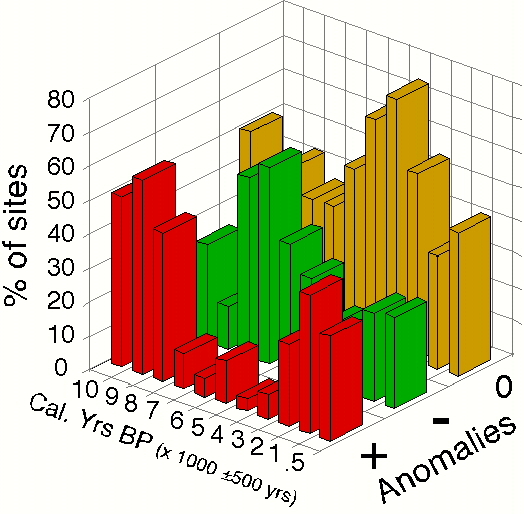 2) indicates that fires were not frequent between 6,800-2,200 BP. Indeed, mean fire interval was about 260 ±208 years before a dramatic decrease to 85 ±55 years at about 2,200 BP. Because this change corresponds and permits confirmation of the change recorded by temporal low-resolution analysis in Quebec (Fig. 1), it provides evidence of the robustness of the fire reconstruction at Lake Francis. This permits comparison of local fire-frequency reconstruction with the pollen curves from the main tree species present over the last 7,000 years (Fig. 3). Reconstruction of the fire-vegetation and fire-climate relationships thus provides a basis for discussing the ecological consequences of climate changes. Between 9,500-7,500 BP, and after 2,200 BP, fire frequency was relatively high resulting from a higher drought frequency. However, the latter period change was not synchronous with changes in vegetation (Fig. 3). Indeed, during the period of low-fire frequency between 6,800-2,200 BP, the vegetation surrounding Lake Francis was dominated by white pine (Pinus strobus) and the Eastern white cedar (Thuja occidentalis), while all other boreal tree species were already present. When fire interval decreased, birch (Betula) pollen accumulation rate increased, and a few centuries later (ca. 1,500-1,000 BP) the current boreal forest dominated by balsam fir (Abies balsamea) occupied the region. There appears to be a lag of a few centuries in vegetation changes in relation to changes in fire frequency. Fig. 2 : Frequency of fire events chronology at Lake Francis. Fig. 3 : Pollen curves of major tree-taxa describing long-term plant dynamics over the last 7,000 years.